In this July 13, 2014, file photo, early morning sun reveals the Grand Canyon as seen from the South Rim at Grand Canyon National Park, Arizona. Grand Canyon National Park officials say they are investigating whether anyone was exposed to radiation at unsafe levels while samples of uranium ore sat in plastic buckets in a park research building. Three 5-gallon (18.93-liter) buckets have been removed from a building about a half mile (8 kilometers) from the South Rim that houses the park's archives and artifacts. About 550 people tour the collections each year, mostly by appointment. The National Park Service is working with Arizona health and workplace safety officials on the investigation. The agency also plans to set up a hotline for anyone concerned about potential radiation exposure, said spokeswoman Vanessa Lacayo. "One of the important pieces is looking and determining the level of exposure and risk," she said. The Arizona Republic cited the Grand Canyon's safety director, Elston "Swede" Stephenson, in saying the park failed to warn workers or the public of the potential harm that existed for years. Stephenson did not return messages left by The Associated Press at his work email and on social media. A call to a number listed for him in a park directory went unanswered. Uranium is naturally occurring in northern Arizona and was mined for decades, including at the Orphan Mine on the South Rim of the Grand Canyon that ceased operations in 1969. 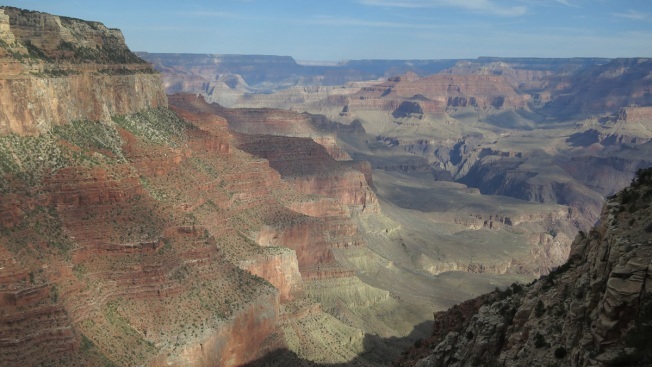 A temporary ban prohibits the filing of new mining claims within 1 million acres (0.405 million hectares) outside the boundaries of Grand Canyon National Park. The Navajo Nation no longer allows uranium mining after it left a legacy of death and disease on the reservation. Still, companies have active claims that weren't affected by the ban and could resume mining. Lacayo said the area where the plastic buckets were stored was not a part of the tour of the building known as the Museum Collection, though people did walk past the area. Stephenson told the Arizona Republic the buckets were near a taxidermy exhibit where children sometimes stopped for presentations, and the lid on one bucket wasn't sealed. Jani Ingram, a professor of chemistry and biochemistry at Northern Arizona University, said it's not uncommon for uranium ore to be used in research. But, she said, it's typically sealed in a metal container so that radon gas and dust aren't released into the air. Uranium can be harmful to people's health depending on the amount and grade of ore, how people interact with it and the exposure time, she said. Geiger counters can be a good, initial indication of the presence of radiation but further study would be needed to determine the risk. "You can't say, 'oh my gosh, all those kids are going to develop cancer in five years' because you just don't know how close they were, how long they were there," she said. "But that open bucket was probably the most concerning. It seemed that maybe whoever it was didn't understand what they had."